I want to choose #1, but in light of the current news about an evangelical whack-job in Florida who wants to commemorate September 11 with the burning of the Koran, I am leaning toward one of the other three options. Once again, I am flabbergasted at the narrow-minded intolerance of some of my brothers and sisters in Christ. I get the fact that whole religions are judged solely on the actions of a few fringe elements — that’s the point. Many American Christians think they know all about Islam because of a segment of terrorists who claimed they were acting in the name of Allah. Now, many people will think Christianity is all about religious intolerance because of our own segment of terrorists claiming they are doing some holy thing. It makes me sick. It makes me sad. It makes me ashamed. At the very worst, others around the world are misguided, unenlightened, ignorant, and deluded — none of which should result in a violent response on our part. Where is the compassion and love? Where do we extend a hand of fellowship to bridge differences and open honest dialog. Certainly some will reject it, but others will accept it. At the very best, people are seeking truth from a variety of directions and by God’s grace and in God’s time all will be sorted out, and we won’t have to waste so much time arguing about who is in and who is out. The bottom line for me is this: violence begets violence, and if we as Christians hold any claim to “a more excellent way” then the burden lies with us to break the spiral of violence. This is not to say we are doormats. We must stand firm to the individuals and organizations that seek to kill, maim, mutilate, and terrorize. But we cannot, must not, extend our response in broad, destructive generalizations of a whole religion. Islam is no more a religion of violence than Christianity — both have histories that should make us shudder and repent, but at their core is a life-affirming and restorative vision. The best of Islam and the best of Christianity are more similar than different. It is at the fringe that both fray terribly and give each a bad reputation. Let’s not lose our heads. Book-burning of any kind is a throw-back to primitive and unenlightened times, but burning the sacred writings of another faith is an abomination. Disagree? Fine. Debate? Excellent. Defend? You betcha’! Attack and destroy? No way! That’s not who we are — at least, not anymore. It is time we finally put an end to the white-sheets-and-hoods mentality that has done so much damage in the past. We are not holier than others, just lucky. We are blessed, and we have a God who we claim is love. Let’s act like it, and stop behaving exactly like those we say we are better than. Obviously I am indignant. This is nothing more than a personal rant. I am fed up with other Christians giving the church the reputation of being petty, small-minded, arrogant, unjust, unloving, and intolerant. We are better than that, and I want people to know it. I would love for us to stand up to intolerance in all its forms and simply say “this is wrong.” I understand that this may be exactly what the folks in Florida think they are doing, but I disagree. I cannot reconcile what I believe about Jesus the Christ with such behavior. Categories: Christian witness, Core Values, Evangelism, Personal Reflection, Religion in the U.S. I feel the same way as you on this issue, and it also makes me sick. The best thing I can do is help others understand that these actions do not bring people closer to the Triune God we worship, but instead, pushes them further away. People who preach fire and brimstone rarely bring confirmands; they bring affirmands. There is but one thing I would perhaps think you may want to reconsider. You say, “We are not holier than others, just lucky.” I’m not sure I would consider Christians “just lucky.” Maybe it is just me, but does that not imply a certain randomness in place of sovereignty. How blessed/fortunate/happy/lucky are those who experience randomness and discern the presence of an expansively loving G*D.
My journey suggests that sovereignty, like beauty, is in the eye of the beholder. Telling G*D about the limits of what can and can’t be done hasn’t proved very fruitful. My own experience is that a fully sovereign god is too small, all work and no play. I’d be glad to hear more offline about a dividing wall between sovereignty and randomness. For the moment I am sensing that Koran burning falls in the sovereignty (either/or) camp and concern about such in the arena of randomness/ambiguity (both/and). Perhaps “fortunate,” privileged,” “blessed,” fit better. I do not consider myself better than others — or holier — I am just grateful for the faith I have and wish others could know its joy. But I cannot consider myself superior in any way. I’ll make a confession. For a time, I actually was sympathetic to people like this pastor in Florida. I think the main reason is the memory I share with so many others–terrorists flying planes into buildings on 911. For me, this event occurred during my first week at seminary. It left a haunting image, and it somehow shaped my understanding of my call…and it left a great deal of anger. Until very recently, I was angry that others could burn Bibles and other Christian sacred symbols and the media would hardly bat an eye at the disrespect. However, I have since felt a deep conviction of such views. I think your “rant” is absolutely right. I cannot reconcile such behavior as burning sacred symbols of other religions as a response terrorism or religious extremism. There are many who would disagree with me, citing we are at war and therefore need to respond as those in war. But a close look at Scripture will reveal that *especially* in times of war/crisis/violence, we are called to the more excellent way. So, as a leader in the church, I will take what many view as an unpopular stand. 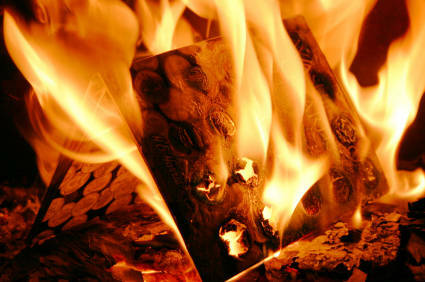 I cannot in good conscience go down the road of burning books to make a statement. Jesus made a statement that still makes the world shudder. He submitted to the violence of the cross and emerged on the other side. That’s really the only statement that needs to be made, isn’t it? Let all Christians repent of following the ways of the world instead of following Jesus to the cross. I pray that the world will know us by His love in us. Perhaps if we didn’t give as much attention to the whackjobs like **** ****, then other whackjobs wouldn’t be encouraged to emulate them. Perhaps if when Franklin Graham uses his father’s reputation to mouth off his right-wing talking points about the President being a Muslim, there was a better response than Rev. Caldwell equating all criticism of the President to racism, then we’d get more people to pay attention. Of course, while complaining about the motes we need to take care of our own logs. We think the Christian Coalition is wrong to say that capital gains tax cuts are supported in the Gospel. It is also true that we need to restrain GBCS in its advocacy of various pet issues that don’t have much support in the pews. The bottom line is that it is radical (and hard) enough to love the Lord with all of our heart and strength as well as to love our neighbor as ourselves. A primary difference between Christianity and Islam is that the strictures on how we treat others apply to everyone as Christians. Those rules only apply to fellow Muslims in Islam. Yet, we don’t practice that very well. Dan describes him as an “evangelical whack-job.” The second part seems fair to me. I’m not sure calling him “evangelical” is fair to most evangelicals. What he’s doing is inflammatory and surely not motivated by love. But why are major media outlets giving such a small group so much attention? …The media also gave attention to Fred Phelps and his followers for a while, until they realized that completely ignoring them was much more effective!